My thanks to Nick Consoletti for inviting me to join him at Peet's with Johnny Stallings. I hadn't seen Johnny in awhile. The story about getting costumes and props inventoried at the prison, so the dress rehearsal could occur, was a fine one. Nancy had put her heart into the jester's bauble and this was the one prop that was nixed. She offered to replace the wooden handle with a cardboard tube, and was given a green light. Johnny both directs and performs plays in prisons. He's a deeply talented guy. We started talking about Richard Nixon and he remembered all about the movie I mentioned. Nick came by for the afternoon, to hang out and use the wifi. He's based in Hillsboro these days, having navigated a change of scene. He comes in on the Max. I'm using Facebook rather intensively these days, which is not my habit. I'm reconnecting with my old school in the Philippines more, plus logging a lot of details about my Quaker doings, wanting to get some of the details into my profile. Hawthorne Street Fair today. 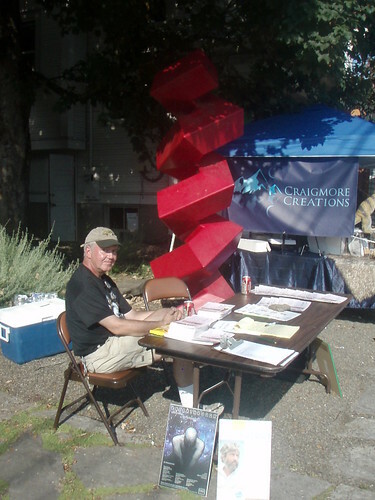 I showed up around the Linus Pauling Center for Peace, Science and Health table, next to the Craigmore Creations booth. Patrick was in charge. I took some pictures. Terry had stopped by somewhat earlier, probably when I was in my Oversight Committee meeting. Again, lots of bread crumbs on Facebook. Some FnB stuff there too, and comments on Tara's blog. I drove Carol to the meetinghouse this morning, then walked back during meeting to grab my laptop. A bike route complete with street cones police directing traffic persuaded me to just leave the car by the Quakers until later. No one drives it but me, so that's OK. Carol got home by other means. Getting to meet the Caldera guy was interesting. Here's one of those youth centric facilities in the Oregon wilderness of the kind I write science fiction about, though sometimes with so much science and so little fiction it's hard to distinguish such writing from investment banking (banking on the future in various ways). My brother in law Sam (Dawn's bro) was a lead carpenter on this Caldera site, which is close to Black Butte, on the shores of Suttle Lake. PJB has discovered LimeSurvey and is finding it useful in working with Hollywood, with thoughts about "smart meters" and "smart houses" never far beneath the surface (polling and feedback is crucial where energy consumption is concerned). I'm quite intrigued by this book Alex turned me onto at FnB: Waking to Wonder, Wittgenstein's Existential Investigations by Gordon Bearn. I'll have more to say on the Wittgenstein list (Sean's). Carol is slogging ahead with WILPF work, researching drones more. She does lots of conference calls. Tara is out of the country. We've been reading her blog. More about her adventures soon. Lindsey, still with us until May, is fine tuning her street busker persona, with music to go with. I'm at the Pauling House this morning. A funny thing happened earlier today: while mom was thinking about Jack, what he might think about the failure of command and control (diplomacy, the political process) in Libya, she heard a loud noise. 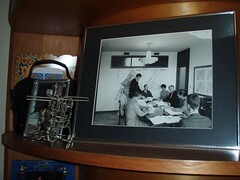 Turned out later that was a framed picture of Jack and his planning team from Rome days, at that moment falling off the "time capsule" and shattering. I've returned it to the top shelf, sans glass and frame. Glenn Stockton raved about this one. Later, Satya brought it up at Lindsey's birthday party. With such discriminating individuals giving it a thumbs up, I queued it with rather high expectations. Tara watched it too. We were not disappointed. The foreground puppets remind us of what I have long considered: that shadow puppets and cartoons, theater more generally, are pretty much the same thing. Here the genres blend, to give a special case reality, yet the generalized principles are what we're thinking about. Many plots hinge on the presupposition that love triangles are unstable and lets say many of them are. I liked the way the puppets blasphemed. Shades of Mystery Science Theater 3000. 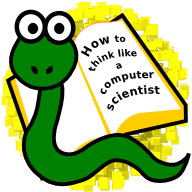 Shadow puppets could help teach Python, other subjects. I imagine those __ribs__. We under-use so many of our best technologies, and over-use so many of our worst. No one is "making us". Conditioned reflexes have staying power and as Bucky Fuller often taught: minus intuition and an openness to upgrades, we stay stuck in our robot-hood. Even this Rama guy could be a real jerk sometimes. A lot of us gathered in Room 12 today, to discuss Marge Abbott's new Pendle Hill pamphlet #402 entitled Christianity and the Inner Life. We had about a two hour discussion, with every chair occupied, John Wish standing. When it was my turn to speak, I expressed enthusiasm for Marge's terminology, as her pamphlet mentions Buddhist Quakers, Jewish Quakers and Christian Quakers. That's enough of a design pattern to free at least a few boat loads of Quakers from the Christian brand if they so wish ("we do" I hear them say). We may have lots of forward branching outside the domain of Christendom (which is like a DNS domain name, lots of web sites). For me, it's like those Elven ships leaving Middle Earth towards the end of Lord of the Rings. And it's not like we don't embrace Jesus as one of us. At least a few of Jesus's best Friends aren't Christian. I can hear them singing in the kitchen. I'm cast as janitor, more "clean up monster", my role kicking in around 5:45 PM. In the meantime, I'm blogging, also ducked out to Horse Brass to radio cell mates about various doings and happenings, imbibed an Ice Ax. My philosophical remarks have been routed and filed. The Internet works well. My role also included navigating from Multhnomah Friends to SE 28th, where there's a bike friendly bridge over I-84. North over East Broadway and along Tillamook or one of those, to N Williams, and the new OTY warehouse. Then back. Pulling SkyBlue. Filed flight plan on Riseup, a local network of listservs, used by Portland's active. 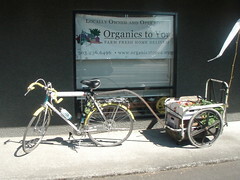 Was I the only 50+ year old in Greater Portland actively intervening to rescue food waste for park feasting? A funny thought to contemplate. Why not IEEE picnics based on this concept? The "not bombs" meme just makes good engineering sense. Why cling to some pseudo-Apollonian apologetics, as to why you'd choose bombs over food? You wanna be some oblivious Nazi or what? Star date, captain's log, blah blah. Tara is on her way from OHSU. The week is frenetic. Food politics in the kitchen, with Satya, Lindsey and Aaron. I brought up some debating points, but Satya's attitude was more "what's to argue about?". I mentioned my "gringo go home" campaign w/r to Quinoa, though as Joe Snyder pointed out on Facebook, gentrification of basic food stuffs is a rampant scourge. Cash crops ya know. Those with money feel entitled to externalize whatever costs eh? Style matters. People want to have the right appearance. A coat of furs may be used to add status, but that approach may backfire. As in Spirited Away, one has lots of ways to turn into a pig.